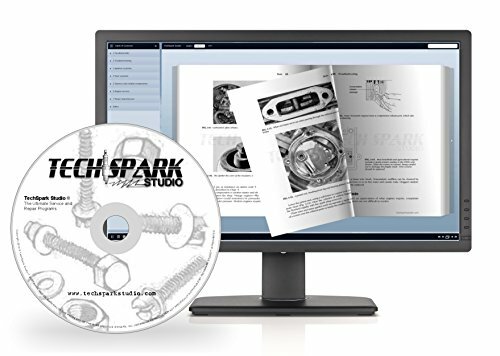 TechSpark Studio is a complete, easy to use software program with all the information needed to maintain and repair your power sport/utility vehicle. The program utilizes a unique digital flipping book technology to give you an authentic paper manual feel on your digital device. But unlike a traditional paper manual, this software can quickly search any term, locating the information you need in seconds. No more thumbing aimlessly through page after page as you would with a traditional manual. You can also create custom bookmarks and find that information you need over and over again, quickly and easily. TechSpark Studio programs also includes an integrated zoom and pan tool to easily focus on every detail clearly as possible. One of the best features is the ability to print specific pages or the entire program and if the pages get dirty and greasy, simply print a fresh copy the next time you need the information. TechSpark Studio programs don't just include all of the model specific information for your vehicle you have, but also extensive basic service and maintenance information that can help with any general service and repair you need to accomplish. Plus gain quick access to the full online parts catalog and complete wiring diagrams for your vehicle. TechSpark Studio programs works on Windows and MAC computers. (Minimum Requirements: Windows XP / MAC OSX 10.4) You will have full access to all the information, without needing to have online access, as the program runs directly on your computer.